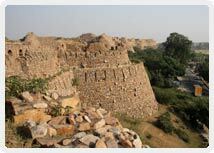 This fort was built by Ghiyas-ud-Din Tughlaq as a symbol of the might of the Tughlaq dynasty in 1321, which was later abandoned in 1327. The fort is perched on a rocky hill at the Qutab - Badarpur Road. This massive fort is spread over an area of 6.5 km and famous for its design, decorations and constructions. 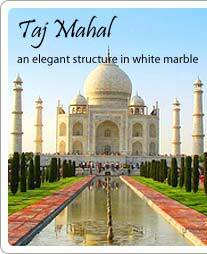 The composite beauty of architecture and scenic vista make this place a favored tourist destination of Delhi. The historical facts reveal that political threat forced Tughlaq to build this fort in a remarkably short span of time. A raised platform was chosen for its construction, specifically for defense purposes. The fort was empowered with massive ramparts and bastions, primarily to check the Mongol attacks. The height of rampart varies from 15 to 30 meters from its base itself. The thickness of the walls is a defining feature of the fort which is ranging from 15-20 feet to even 35 feet in some places. The fort is divided into three parts the first part comprising of city area with houses. The second one is a citadel with a tower and the third one is the adjacent palace area with royal residences. The foremost attractions of this fort are the Mausoleum of Ghiyath al-Din and Quila Kuhna Masjid which an architectural grandeur made from white marble and bright red sandstone. The other prominent attraction of this fort is light and sound show in Hindi and English, which presents the glory of 5,000 years of India's history. The timing of this show is from 5 pm to 9 pm.